The visit took place two days ahead of the village’s traditional festival, held annually between the 14th and 16th days of the second lunar month. Talking to local authorities, artisans, and people of the village, the PM expressed his impression on the local preservation of traditional cultural values and economic development amid the growth of a market economy, saying they reflect local national patriotism. Acknowledging inadequate policies in support of craftsmen, Phuc affirmed the Government will continue working on the issue and creating better mechanisms to facilitate the planning of Bat Trang village. 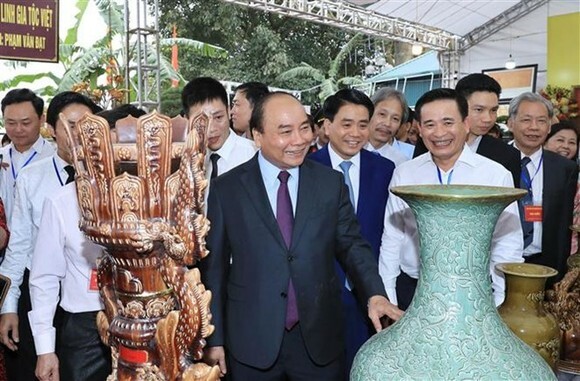 Praising overseas and domestic distribution of Bat Trang potteries, he suggested the application of advanced technologies for improved quality and product diversity. Phuc said the achievements the village has obtained can serve as an example for its peers nationwide. Highlighting good outcomes of new-style rural building in the village, the leader urged local authorities to help expand traditional craft production and pay attention to environmental protection. He required the authorities to connect the village with travel agencies to capitalise on the customer source of millions of tourists to Hanoi.